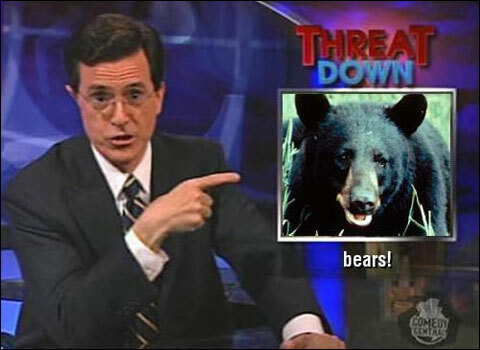 The Republicans are now officially the Stephen Colbert party as they rally around a tough anti-bear platform. This is an old line… But even if it was the biggest waste of $3 million in history — even if it was money to sedate grizzlies so hairdressers could apply attractive red tints to their fur — do we want a candidate for president of the United States obsessing about it? This month, the secretary of the interior is expected to rule on whether polar bears should be listed under the Endangered Species Act. I strongly believe that adding them to the list is the wrong move at this time…..The Center for Biological Diversity, an environmental group, has argued that global warming and the reduction of polar ice severely threatens the bears’ habitat and their existence. In fact, there is insufficient evidence that polar bears are in danger of becoming extinct within the foreseeable future. Maybe this all has some encoded relationship to the Russia-Georgia conflict and a symbolic revival of Cold War politics? Excellent post, and is this not interesting times? 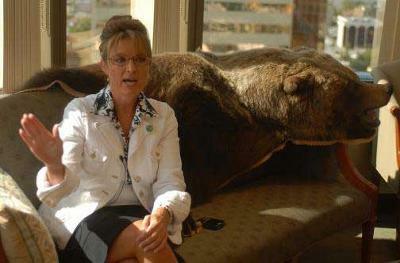 there’s an even better version of that Palin photo that shows the giant crab she has sitting on the table in front of the dead bear carcass she calls a “couch.” She has it in for crustaceans, too.